Compass services initially provided Household pest control and rodent services and termite post & pre-treatments for new construction. 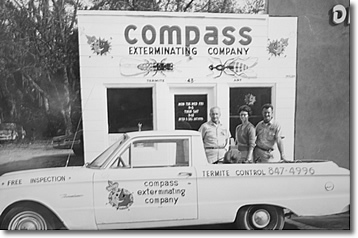 In 1979 Compass expanded our services to include Lawn and Ornamental care for the control of insects,weeds, diseases & fertilization on lawns and ornamentals. In 2007 Compass expanded again to include a Do It Yourself center for people that have the time & enjoy doing their own Household pest control services or Lawn care. We also provide the expert advise on applying the products in an effective & safe manner. Stop by or call us today. We are always happy to help with all your pest control needs or any questions you may have.